Getting ideas for new blog posts to write can be challenging. There are tools and techniques that can be used to quickly generate hundreds of ideas for topics, and in this article I am going to show you step by step, how to get ideas for blog posts so you will never run out. The best part – all the tools are completely free to use. So you do not need your credit card to buy fancy tools. You just need a bit of time to sit down and do some research following the methods I will show you below. Before we get to the tools and techniques, I just want to give you a few general advice about how to research for new content and blog post ideas the most effective way. Staying organized can help you a lot. So make sure you have a document (I use Word or Excel) to note down all the ideas you get. Some ideas might seem a little far out right now, but if there is any chance it could make sense to write about it at some point, just write it down for now. See it as a blog brainstorming session when you sit down and use the tools. The point about generating a lot of ideas fast is to get a big list of potential ideas. Once you have a huge list, you can choose the once you want to write the next few weeks or months and refine the ideas. And you can then always go back to this list and get more ideas. Making a list like that can literally give you hundreds of ideas within 30-60 minutes depending on how familiar you become with the tools I am going to show you. Also, every time you get an idea for a new post, quickly add it to the list. In my experience ideas can pop up any time (even when you are not doing research), and if I do not write it down fairly quickly, it can disappear again. So write ideas down as soon as you can – it does not have to be perfect ideas, but just write them down before you forget and then expand on them and make them into awesome blog posts later. But enough talking – let’s get to the tools you can use to do this. Below you will find a list of 6 effective tools and techniques you can use to generate content ideas for your website. Each of them will be able to give you A LOT of ideas, so you can either just use a couple, or you can use all of them depending on your needs. There are not presented in any particular order, as the best methods depends a lot on you and your preferences. Ubersuggest is a pretty cool tool that can generate hundreds of content ideas very quickly. It is owned by one of the big authorities within online marketing, Neil Patel. 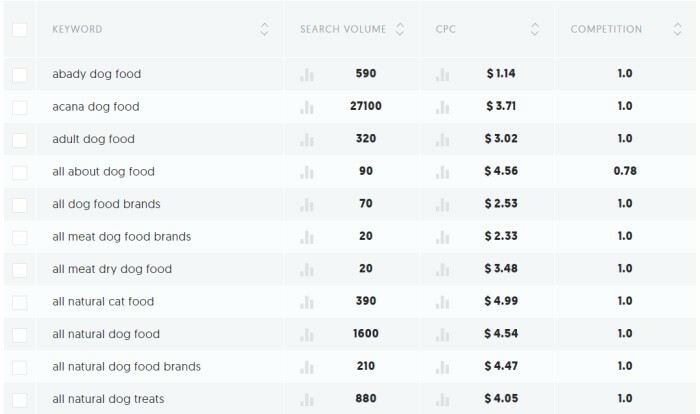 It is very simple and fast to use, and it also gives you other data than just ideas for content. Personally, I think it is mostly useful as an idea generator and do not use the other data so much. To get more precise data before deciding which ideas I want to write about, I instead use the Jaaxy Keyword Research tool, but Ubersuggest is definitely great for idea generation. You use it by just simple going to the Ubersuggest website, where you will see a search bar like below. You then write a word or phrase that you would like to get ideas for. In the example below I chose the words “dog food”. You can then choose language, which means it can be used to generate ideas in a lot of different language, which is great. After you click “look up” the tool will think for a few seconds. And then it comes up with hundreds or thousands of ideas depending on your topic. You get hundreds or thousands of content suggestions in a few seconds. Be aware that of course not all the ideas will be good, so you have to go through the list and pick out the ones you think are relevant for you. The list is by default sorted alphabetically, so the example below only shows some ideas starting with the letter a. An example of some of the many suggestions to go through and sort out. As you can see, there is a lot of ideas to go through and sort out, and just by using this tool, you can get enough ideas to keep writing content for your website for a while. Answer the Public is a fun tool. It sometimes comes up with some crazy suggestions that are completely useless, but it also has great and alternative suggestions. It is very visual in its suggestions, which can be very inspiring and help with creativity. 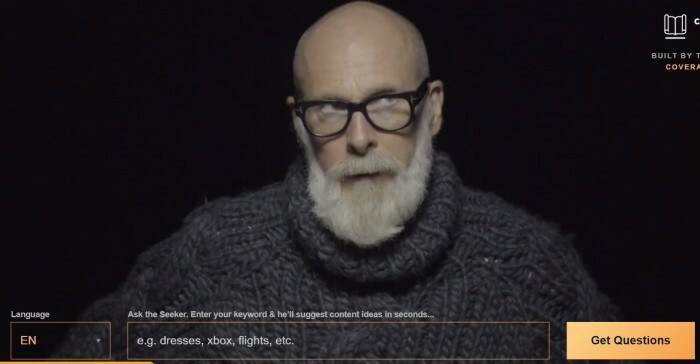 When you first come to the website, you right away feel the different atmosphere and approach – a man in sweater and glasses is moving around looking impatiently at you to get started:-) So to get started you just need to write a phrase or word, select the language and press “get questions”. 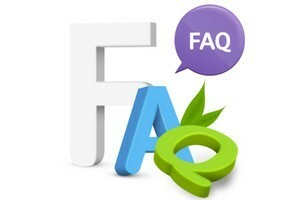 Answer The Public website where you can type in your topic. What you will now get is not just a list of content ideas, but sentences in several categories, and they will all be presented to you visually. The categories are “questions”, which will give you a lot of ideas with questions your readers might want to know about your topic. “Prepositions” where you will see a lot of sentences with prepositions. And there is also a “comparison” category, which will give you content ideas for posts with comparisons. Be aware that there might not be ideas for all words/topics. Also, sometimes I have noticed that at first it does not show any words in the overview, but when then scroll down the visualizations with a lot of ideas are still there. A great aspect is that you can download the visualizations as images for free. Below you can see an example of a visualization with questions when I used the search term “YouTube”. A visualization with questions for the topic “YouTube”. Answer The Public is not a 100% stable tool in my experience, but it is different and fun and can give you some alternative ideas you would probably not come up with otherwise. So definitely still a tool worth checking out. The next idea generator on the list is more a technique than a tool. It is one that draws on data from Google which is great, as you want to make content people search for in Google. I was first introduced to this technique through the training platform Wealthy Affiliate, and it is now one that I use all the time to come up with content ideas. Once you get used to using it, it can generate a ton of ideas in no time. It is actually very simple. You go to Google, and you have probably already noticed that as soon as you start typing anything in Google there are a lot of auto suggestions coming up. This is based on what people often search for and can be a way for you to get new ideas. By writing “content ideas” you can see below that several great ideas for potential topics came up. Google comes up with suggestions as soon as you start writing. You can even expand on this as the suggestions continuously change when you type. So if I after the phrase mentioned above just write the letter a, I will get even more potential topic ideas. Expand on the suggestions by adding a letter in the end. And if I type the letter b instead, several more ideas come up. 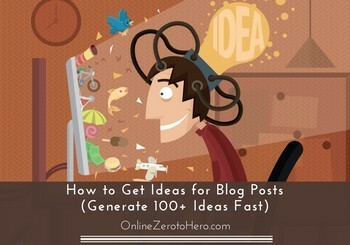 You can go through the whole alphabet and get thousands of blog post ideas. You can literally go through the whole alphabet like this for any phrase or word. And you can also add letters in the beginning instead and then get a lot more ideas. This is an amazing content brainstorming technique, and in just 10 minutes you can generate enough ideas for blog posts for the next 3-6 months. Google Trends is a tool that is often overlooked when it comes to generating content ideas. But it can be very useful, and as all Google’s tools it is free to use and has a lot of great data. It is mostly a tool used to see what topic is trending. You can see how the interest of a certain topic (in Google searches) has changed over time. That alone can be very useful to see if a topic (and a potential blog post) is mostly seasonal, if it is just becoming popular, or if it has no interest at all. 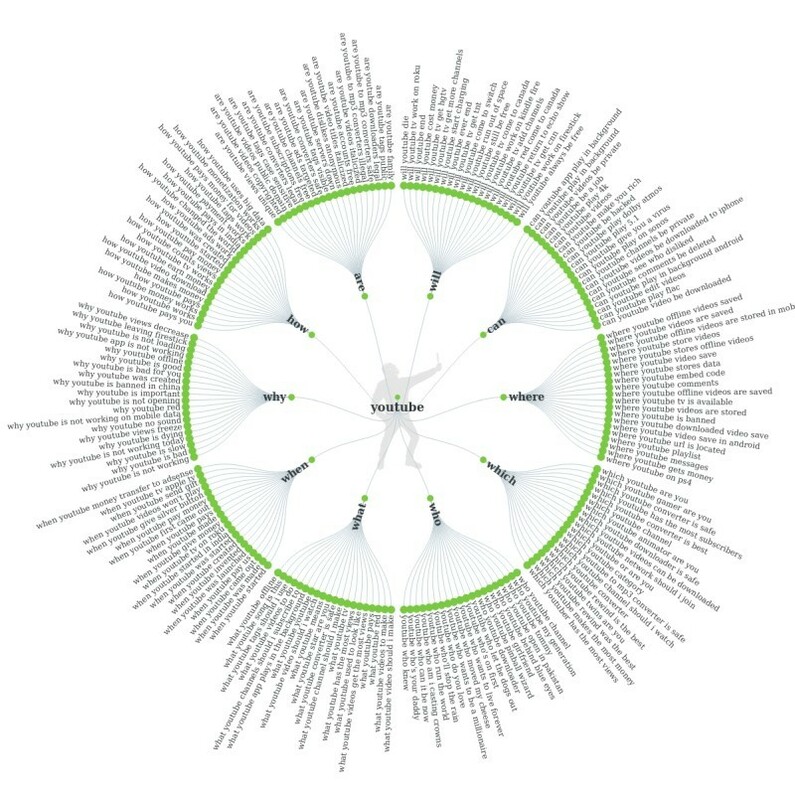 Below you can see an example of the interest over the past year for the search term “organic food”. As you can see it is an interest that is pretty consistent. An example of a Google Trend graph. In addition to seeing what is trending and what is not, Google Trends can also show you related searches. That means that you can see what people that are interested in the topic you searched for might also be interested in. This can give some great ideas for new content for your website. Usually you will get 25 related search suggestions, and there will in most cases be several great blog post ideas among these. 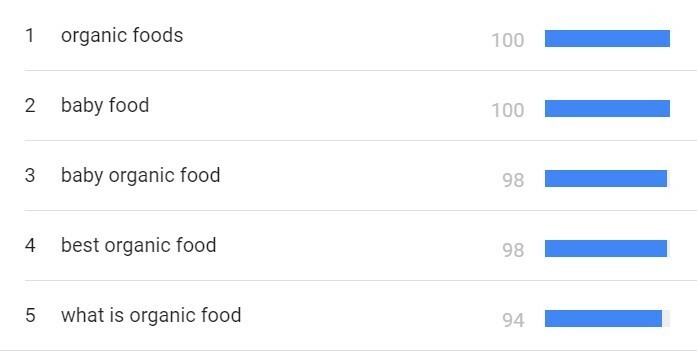 Below is an example of some of the related searches for “organic food”. Google Trends comes up with related search terms (and thereby content ideas). The next one on the list is very simple, but sometimes the simple solutions can be amazing, but we do not think about them, and therefore I want to include it on this list. If you already have customers or a website audience, you probably often have questions about all kind of things. If you have a brick and mortar business, you probably have questions in your store or over the phone all the time. This can be a great source of inspiration for blog content. You want to make content that visitors are interested in reading. So if you already have customers/visitors, listen to their questions and use it as an inspiration. A lot of great content can come out of this, you can be sure your customers will love it, and it can be a great way to generate traffic and potentially even more customers. Almost no matter what line of business you are in or what niche your website is about, there will be other blogs as well. Find some of these and have a look around the sites to see what kind of content they write. 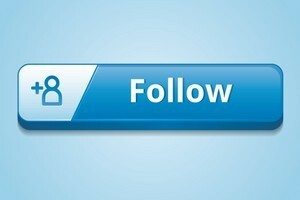 And follow them so you will get future updates. This can give some great ideas and inspiration, but I want to emphasize that you should NOT just copy what you see on other sites. It is a way to get inspired and see what is going on in your field of business that you might have missed (we cannot know everything). Especially, if you follow some of the big authority websites within your niche it is a great way to keep updated. Some of these sites have many people working for them and have very good connections, so they have more resources to for example find out about future changes, releases etc. This is great info for you to have, so follow them and keep updated. But remember – it is not about copying. Copying is unethical and at the same time it can also hurt your business and your rankings in the search engines. So follow other blogs as a way to trigger inspiration and then use that to create your own articles with your own particular point of view and focus. Do not just copy or rewrite the good articles – it will not get you anywhere in the long run. As you can see, you do not have to pay for any tools to be able to generate a ton of content ideas for your website in no time. It is quite easy once you get a bit of practice, and you will never have to worry about coming up with new ideas for blog posts. So choose a couple of the tools/techniques you think sound the most interesting and test them out. Feel free to let me know in a comment below what your favorite method is (also if your favorite methods is not even on the list above). I would love to hear your experiences. If you ever need any help or have any questions, just leave a comment below, and I will be more than happy to help.